Abstract: Pärnu River, the largest river in Estonia, flows into the Pärnu Bay in the Baltic Sea. River inputs induce a sediment plume visible from satellite data. In this area, the coast of Estonia is shallow. Thus optical properties of coastal waters are influenced by particles coming from the river and from resuspension by storms. The anthropic influence caused by ships and dredging may also influence coastal water properties. The sediment outflow may have an important impact on the ecosystem and for the management of the bay. The nature and characteristics of the suspended particles in Pärnu Bay are highly variable and few studies were conducted in this area. The goal of this study is to validate Sentinel-2 and Sentinel-3 satellite products and develop algorithms for complex coastal areas. These questions are included in a PhD project submitted in spring 2017 to University of Tartu. In collaboration with CEFREM laboratory (Centre de Formation et de Recherche sur les Environnements Méditerranéens), a joint unit of CNRS and University of Perpignan in Southern-France, field campaigns will be organized during different seasons to study variability of suspended particles characteristics in the Pärnu bay under various river outflow conditions and study the contribution of storms. We will use an innovative approach, using a set of instruments containing in-situ laser and holographic granulometry (LISST-100X, LISST-HOLO), a CTD, optical sensors. 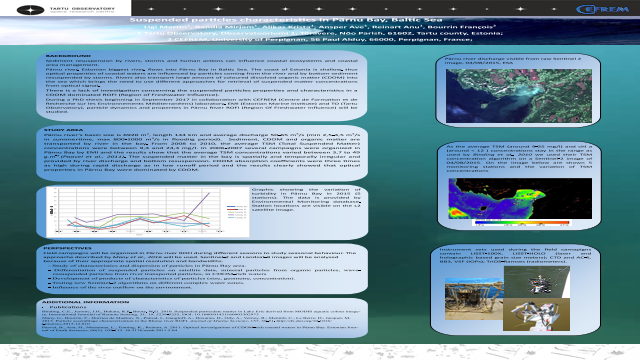 On the poster we show the background of this study using satellite and historic data, of plume’s actual size, turbidity range and nature of particles. Summary: On the poster we show the background of this study using satellite and historic data, of plume’s actual size, turbidity range and nature of particles.References: Binding, C.E., Jerome, J.H., Bukata, R.P., Booty, W.G. 2010. Suspended particulate matter in Lake Erie derived from MODIS aquatic colour imagery. Many, G., Bourrin, F:, Durrieu de Madron, X., Pairud, I., Gangloff, A., Doxaran, D., Ody, A., Verney, R., Menniti, C., Le Berre, D., Jacquet, M.